The comfort food that reigns supreme over all comfort foods: Mac and cheese! This cheesy concoction comes in some seriously impressive varieties in Missouri. From traditional takes on the dish to options complemented by all kinds of bacon and barbecue, here are our favorite places in Missouri to get this classic. Salt + Smoke is a beloved fixture in the St. Louis barbecue scene—who just happened to receive some pretty high honors in a recent mac and cheese throwdown. That’s because their white cheddar cracker mac is worth a visit to the restaurant in and of itself—no pig required. Folks in Kansas City can’t get enough of the fancy mac and cheese from Extra Virgin. The brainchild of renowned chef Michael Smith, Extra Virgin’s take on the beloved comfort favorite is a poblano mac and cheese that’s prepared with hand-made pasta. Creamy, elegant, flavorful—it’s delicious. Mac and cheese does not necessarily have to be delivered in a bowl. Sometimes, and in some places—like CoMo Smoke and Fire in Columbia—it can be served on a sandwich. With pulled pork. Or brisket. And barbecue sauce. At CoMo Smoke and Fire, you can get the smooth, creamy mac and cheese on the side or on top of just about any sandwich they serve. Go on—think outside the bowl. Not surprisingly, another favorite mac and cheese spot in St. Louis is also another favorite barbecue spot. Capitalist Pig specializes in craft barbecue that uses meat and ingredients which are sourced as locally and sustainably as possible. More importantly, their food tastes amazing, like their white cheddar mac and cheese that’s made with farmhouse cheddar and other heritage cheeses. When you’re in Joplin, definitely head to Crabby’s Seafood Bar & Grill to feed your fish or shellfish fix. But why not get it in mac and cheese form? The lump crab mac and cheese on their lunch menu starts with cavatappi pasta. It’s then tossed with a smoked Gouda mornay sauce, fresh crab meat and applewood-smoked bacon. The whole thing is then crusted with a layer of panko. Mmmmmmm…. Gram & Dun specializes in taking traditional dishes and elevating them by spinning their own interpretation of the classics. Take, for example, their burnt end mac and cheese. You’ve got your pasta, blendeded with fontina and pecorino. But then they add their smoky house barbecue and a chicharron crumble to make it smoky and porky and yummy. Award-winning and renowned for its take on comfort foods, Flat Branch Pub & Brewing is a favorite among Columbia’s foodies. One of the reasons is Flat Branch’s evolving take on mac and cheese. They’ve offered the creamy elbows of joy in pizza form, baked with adobo pork, and tossed with smoked salmon. It’s not on their daily menu, but the specials are worth the wait. If you’re looking for the best mac and cheese in the Ozarks region, you’d best stop into Smokin’ Bob’s BBQ in Springfield. 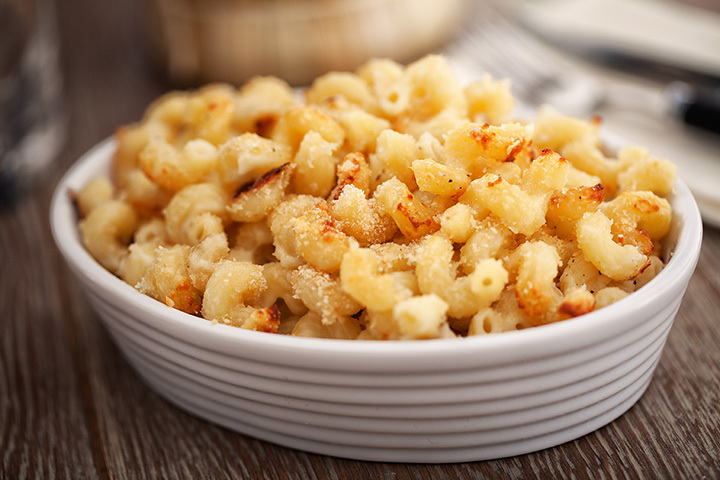 Their smoked mac and cheese is made with your standard macaroni noodles, tossed in a creamy cheese blend to add just the right level of smoothness. And then they mix in some burnt ends to give it the smoke. You won’t be disappointed. St. Louis’ Southern specializes in Nashville-style hot chicken and all the other awesome culinary comfort foods that come from the South. Like mac and cheese. But Southern goes a little further with their take on the classics. Their mac is baked, casserole-style. So it comes out piping hot and crispy on the top. Lobster mac and cheese has been a thing for a while now. And that means that folks around the country have some time to perfect their recipes. In Missouri, few do it better than Columbia’s Room 38. Cream, a blend of three melted cheeses, butter-dipped lobster, pasta and sprinkle of Parmesan is all it takes. Bon apetit!